Even though I’m becoming more interested in exploring new techniques and focusing on quilts as art, I still want to continue making traditional quilts. I’ve never been very good at strictly following patterns — I always find myself wanting to put my own twist on them. As I experiment more, I’m sure this will continue to happen with the traditional quilts I make. I do still want to make quilts that can be used and cuddled with. Quilts that have no more meaning than being something that keeps a person warm and gave me something to do. I thought that we were going to be watching the first half of Fellowship of the Ring tonight, but the boys changed their mind and decided to watch The Lost World (Jurassic Park 2). I wasn’t particularly interested in that, so I went back to the sewing room, and finished my top. I also got the binding cut, sewn and pressed. I also know that the binding is much longer than it needs to be, so I won’t have a nasty surprise when I am ready to bind it. 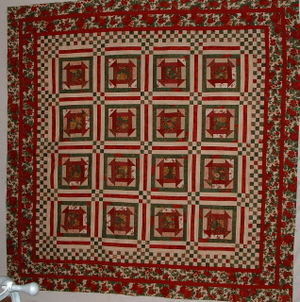 It’s nothing spectacular, mostly it’s just about the beautiful fabric and wanting to make a quilt using a certain block. The green and white checked border might still be overkill, but it’s done. It needs to be quilted before I pass judgment about whether or not I am really happy with it. I hope to get the quilting done soon. I meant to post yesterday, but I got busy sewing, and ran out of time before we had to leave for our afternoon and evening activities. By the time we got home I was just too danged tired to sit here and write anything. I’ve had another good, productive day of sewing today, and am pleased to report that the churn dash quilt I posted about a few weeks ago is almost all put together. I’m still working on borders, and will post a picture as soon as those are done. In that same post (about the churn dash) I posted a picture of my longarm round robin quilt. We have all now sent our quilts to the next person in line — I got Jan’s yesterday. Sometimes I tend to procrastinate, but I’ve decided that I would work on these just as soon as they arrive. I worked on my section of border on Jan’s lovely quilt, and it is now done! I wish I could quilt the whole thing — it is a great quilt. I can’t post pictures of it yet, though. We want the quilt’s owner to be surprised when the quilt is all finished and returns home. I cheated a little bit and made 2 of my daily art projects today. (I skipped yesterday, see above, re: running out of time). As the month has progressed, I’ve tried to challenge myself to make more of them out of fabric, as opposed to using the paper business cards and drawing on them. For the "T" card I chose to Test a new Technique. Dianne had posted about making plastic wrap fabric a few weeks ago. I had some blue colored plastic wrap and played with that a little bit today. I’m not sure I’ll do it again, but it was sort of fun. The fabric I used was all about the same color, and maybe it would look cooler if I used more colors. 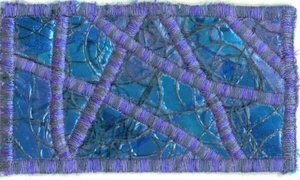 One thing I’m finding is that I’m becoming more comfortable with using the satin stitch, in part to finish the edges, but also here as a design element. I also had fun making a little umbrella — which you can see in the 365 Art photo album (link is in the right hand column). We got some more snow here in Iowa over night and through the morning, so the boys got to go out to the farm and snowboard. They came home with sopping wet gloves and hats and stuff, so they must have had a good time! It’s almost time for our popcorn and movie night, so I’d better go get prepared.